Jamaican Blue Mountain coffee is rare enough. Expensive too. Even rarer is the peaberry version of this coffee. On its own, these peaberry beans don't give a very good cup of coffee. But when you use a few of these beans with some regular Blue Mountain coffee beans, you can create some very interesting variations in the taste profile and some outstanding cups of coffee. Join in and write your own page! It's easy to do. How? Simply click here to return to Your Coffee Photos. 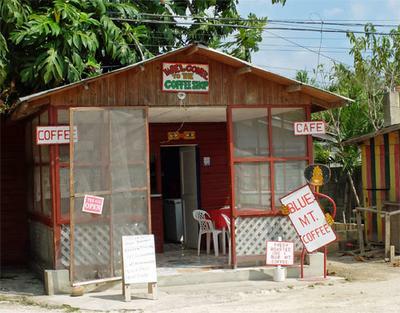 Where to find a cup of inexpensive Jamaican Blue Mountain coffee. 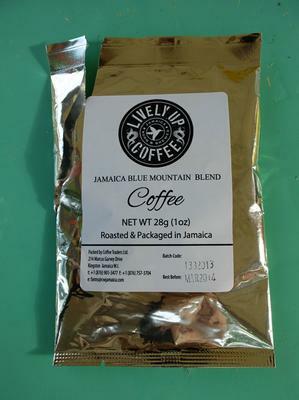 Here in North America, Jamaican Blue Mountain coffee is a pretty fancy coffee. It's hard to come by and expensive too. But if you walk the streets in Jamaica you'll find simple roadside cafes like the one in this photo, and just drop in for a cup of Blue Mountain coffee. Coffee in hotels is not known for its quality. So it was a nice surprise when visiting Jamaica to find their famous Blue Mountain coffee in our room. It turned out pretty nicely, the only limit to the quality of the brew being the cheap coffee maker. Next time I visit Jamaica I think I'll take my own coffee maker! 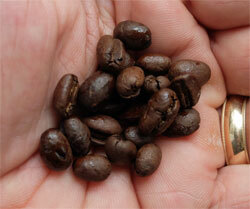 I took this photo on a later trip to Jamaica when I took a four-day tour of the Blue Mountain coffee growing region. Amazing trip. I visited various coffee farms, coffee processing plants, and the Jamaica Coffee Industry Board. 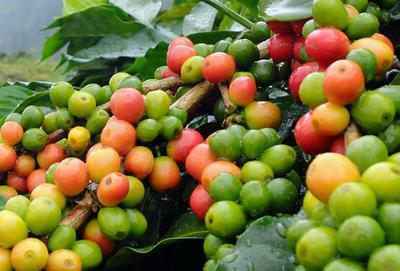 The photo above was taken high up in the mountains and shows coffee cherries on the tree. As you can see, the cherries are at different stages of maturity, with the bright red cherries being ready to pick. Each tree has to be picked several times, so every cherry is picked only when it’s ready. I learned a huge amount about where coffee is grown, and about the process of getting the coffee from the seedling all the way to the cup. It’s a long journey, and a lot of work.